The below information is from The Famous Grouse and the contents has not been modified. The Naked Grouse, the newest member of The Famous Grouse family launched just this year, has picked up an award at the Scotch Whisky Masters. Winning a Masters in the premium blends category, The Naked Grouse was described as ‘a revelation’ by members of the judging panel. This follows on from The Naked Grouse’s recent success in the Scottish Field Whisky Challenge 2011, where it won the ‘Bottling of the Year under £35’ category. The Scotch Whisky Masters awards team was chaired by Patience Gould, Editor of The Spirit Business. The panel featured journalists, mixologists, restaurant managers, whisky sellers and bloggers. Other judges include Dominic Roskrow, Freelance Journalist, Sukinder Singh from The Whisky Exchange and Kane Brooks, Head of Mixology at The Folly. Following a record number of entries, The Naked Grouse was one the few blends to receive a Masters Award. According to chair of the judges, Patience Gould: “This [The Naked Grouse] was an instant favourite. Its sweet, almost toffee like nose demanded to be tasted - and there was no disappointment. It has a great after taste of all things that you’d expect from a Scotch plus a hint of smoke - dangerously moorish. To win a Master award a Scotch whisky has to appeal to all the judges and The Naked Grouse did just that!" The Naked Grouse contains two of the world’s most renowned malts – Highland Park and The Macallan, which are then slow-matured in first fill sweet sherry casks – the most expensive in the world. This process gives the whisky an unrivalled smoothness of flavour, creating a new breed of Scotch that’s sherried, ultra smooth and easy to drink. The Scotch Whisky Masters is in its 4th year and forms part of The Spirit Masters series, which are fast becoming one of the most respected and high profile trade competitions in the industry, attracting a vast number of entries from leading brands all over the world. 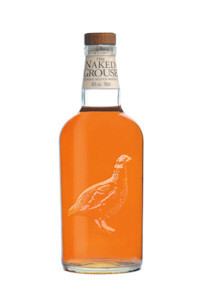 The Naked Grouse is available in high end bars and retail outlets such as Royal Mile Whiskies, Vintage House, www.masterofmalt.com, Tesco and Asda priced at £27.69.